This has been a pretty hectic couple of weeks. With a member of staff down at work, the day job became almost insane. I don’t begrudge my colleague her time off at all. But it does mean that life gets insanely busy. But you know, them’s the breaks. It does mean that my flexi-time remains at stupidly high levels, thus giving me the chance to take time off outside of my annual leave quota. So I took Friday off. I took Friday off so I could sort out Project: Bedfellows. I have to say that this has been a complicated project for me; perhaps the first one that I’ve had any sort of ‘issue’ with. In my usual way, I’ve been trying to figure out what the problem has been and I’ve sort of narrowed it down to this fact. Writing a short story on the back of writing two novels effectively back-to-back (with a break for a 30k novella) is a bit mental. Getting my head out of the ZOMGOOSE! EPIC! scale and back into short story land has been difficult. I keep wanting to tell more story than I need to. It’s damn good though, because it’s forced me to self-discipline the writing beast. I’ve also done the one thing with this story that I know I should never do… edit as I’m going along. Everyone ultimately finds their own favoured way of working. For me, it’s get the story down and worry about the editing afterwards. This time, I’ve tried my hand at doing it the other way around. I won’t be doing that again. FIVE TIMES I’ve scrapped and re-started this story. I’m pretty pleased with where it is now, but that’s been quite stressful for me. Again, I think it’s because of the novel-writing mindset. I thought that switching from short story to novel would be the tough transition, but for me at least, it turns out it’s the other way around. Anyhoo, Project: Bedfellows should be finished in the next day or two. Then I can start giving thought to Project: Loophole. So one way or the other, the last couple of weeks have been super-stressful. But I’ve had a really nice weekend which started with that Friday off work. Yesterday, myself, Dearly Beloved and Not So Small Anymore Son were down at Warhammer World. They nabbed a table and indulged in some ork-on-guard-action and I joined m’colleague Gav Thorpe in signing shenanigans. 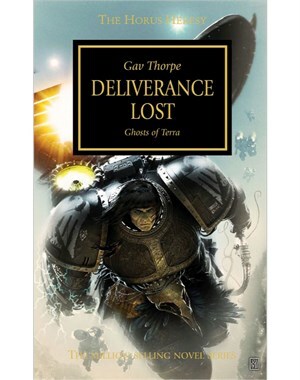 Gav was signing copies of the newest Horus Heresy novel, Deliverance Lost which I’ve been really looking forward to. I got home last night and read it cover to cover in about four hours. It’s not very often that I get a chance to do that with a book, but I thoroughly enjoyed this one. I enjoyed the guessing, I enjoyed the emotional rollercoaster that Poor Old Corax (and his single tear of emo man pain) goes through. It also contains the Alpha Legion and well… I just love those sneaky little bastards, so all in all it was always going to be a winner for me. Totally enjoyable. Check out Corax's emo MySpace shot. It was a fun signing event. I enjoy these things, because I’m generally pretty affable and think that it’s nice to meet people. It’s all a bit crazy and overwhelming at times; there were at least three separate occasions yesterday when I felt slightly dazed by the whole thing and more than a little humbled by the people who made incredibly encouraging comments. I was pleasantly surprised by the number of people who asked questions about Valkia the Bloody, too – seems that she’s already got herself a lot of interest. She turns up in a short story in Age of Legend as well… doing what she does best. You know, the killing people for fun and profit thing. Best of all was the chance to actually have a proper author-y chat with Gav. We’ve only met on a handful of occasions before and never seem to get the chance to just sit and Talk Writing. We did that yesterday and it was all pretty useful stuff. We also discussed the relative evilness of rodents and the fact that all chinchillas look like they are just waiting for the first opportunity to take over the universe. I am plotting your downfall, pleb. There may be a signed-copy-of-The Gildar Rift competition later this week, once I think up something suitably evil. And I can’t end this without sharing a link to the artwork for James Swallow‘s forthcoming Horus Heresy book, Fear to Tread. Because it features Sanguinius. And a Bloodthirster. Fighting. In the air. This entry was posted in General, Writing and tagged Black Library, blather, Gildar Rift, I'm an author now, life, Silver Skulls, Valkia the Bloody, W40K, weekend, WHF, Writing. Glad you had lots of fun! I’m slightly bummed that I can’t talk to Gav at BLL since he is not on the list of authors attending. I keep telling myself that that is only because the list is only half-complete. I’d love to talk to him about his books with Angry Robot and talk about Corax and Astelan and Boreas. Ah well. Did you get a chance to game by the way? I can’t! People keep getting me to write books and stuff! But hey, the writing gig is definitely going great for you! Can’t wait for the mass release of TGR myself. I know all the initial feedback has been pretty good from what I’ve seen, but I’m really interested to see how the wider audience takes it. I hope you know how misleading “30k Novella” can be read. I had to double take and think about it for a minute ON A SUNDAY! is the word “word” too hard to put in the middle to spare the anguish, giddy excitement and the pangs of jealousy. They’re working you too hard if four letter words are proving difficult to master. Misdirection is my raison d’etre. 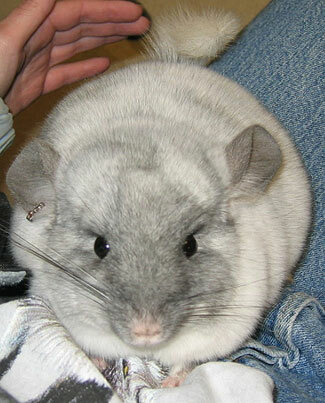 That is one bling chinchilla! It’s cos he is a rodent, innit?